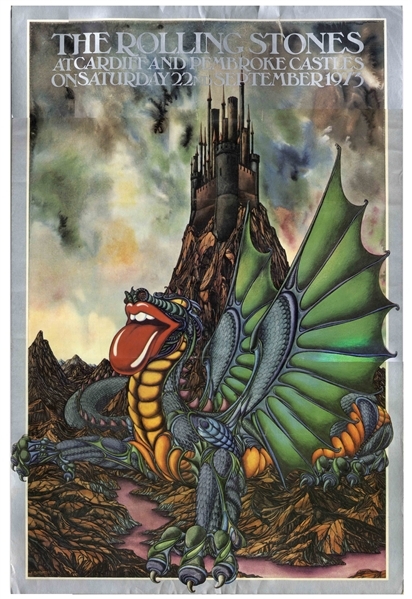 Rare original Rolling Stones poster for their concert scheduled 22 September 1973 at Cardiff and Pembroke Castles in Wales, cancelled by the Welsh authorities so as not to corrupt local youth. As a result of the cancellation, nearly all the posters were destroyed, making it one of the most collectible Stones posters. In addition to using the traditional four-color process to print the poster, designer K. Burness used silver as a fifth color for lettering and the border, to stunning effect, with reprints lacking the silver finish, and also measuring smaller than the 20'' x 30'' size as found here. Poster originates from the collection of Alex ''Higgy'' Higgins, tour and stage manager during the 1970s and 80s. Approximately 1.5'' scuff at top, touching the T in Stones, and light creasing. Overall very good plus condition, displaying beautifully with bright colors.